BAT - BLOG : BATMAN TOYS and COLLECTIBLES: BATMAN: THE BRAVE AND THE BOLD - Maxi Kinder Surprise Egg Spotted in France! 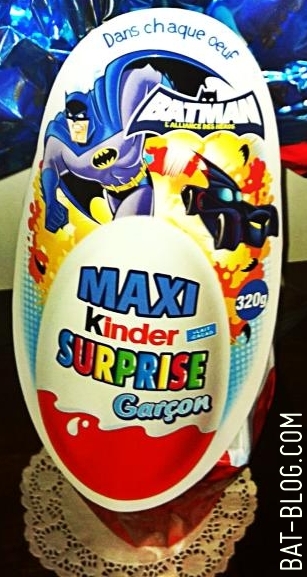 BATMAN: THE BRAVE AND THE BOLD - Maxi Kinder Surprise Egg Spotted in France! Here's a really great photo we got the other day from out good friend Salvatore who said he bought this new Batman item in France. It's the BATMAN: THE BRAVE AND THE BOLD Maxi Kinder Surprise Egg, which is way bigger than the regular ones. Now, some of my American Readers are going to ask, "What is a Kinder Egg?". Now the bad news, they're not sold in the USA, or legal for export, because it's not safe here to have "toys hidden in food products". Yeah, bummer! I guess some (not all, some) American Parents are too lazy to teach their kids how to not be stupid and choke on stuff... kind of sad really. We have the same stuff in Mexico. Never seen any Batman ones though.